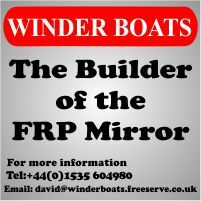 Editors Note: needless to say, making this modification will take your Mirror dinghy outside the current class rules, however it may be of interest to those who don't want to race. Tim Glover from the Amateur Yacht Research Society describes his project looking at alternatives to the traditional daggerboard. Sailing fast with a daggerboard in shallow water maybe very hazardous. The father of the owner was doing just that when he ran aground. The boat stopped immediately but he did not. He was thrown forward and his shoulder collided with the starboard mast shrouds, causing: very spectacular bruise. So the first solution that we tried last year was to fit leeboards to the boat (pictures 1 and 2). These worked well but they did have to be changed over on each tack. There was some discussion as to whether they were better than a completely new centreboard. So this summer, because the daggerboard casing was leaking and a large area of the main hull was also rotten, it was decided to replace the bottom of the hull, and then replace the whole daggerboard system with a hinged centreboard instead. So as can be seen from the pictures 1 to 12 this was done. The big question was whether or not to replace the thwart. It was decided to leave it in place so the (dagger) board had to be cut away to accommodate the seat in its standard position, Time will tell if this was a good idea. 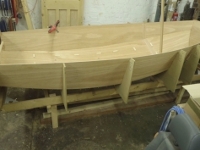 The white Mirror dinghy in pictures 3 and 4 will also be modified using a full size daggerboard as a centreboard, but we will move the seat up about 3 inches to fit the board in at full-size as a comparator. 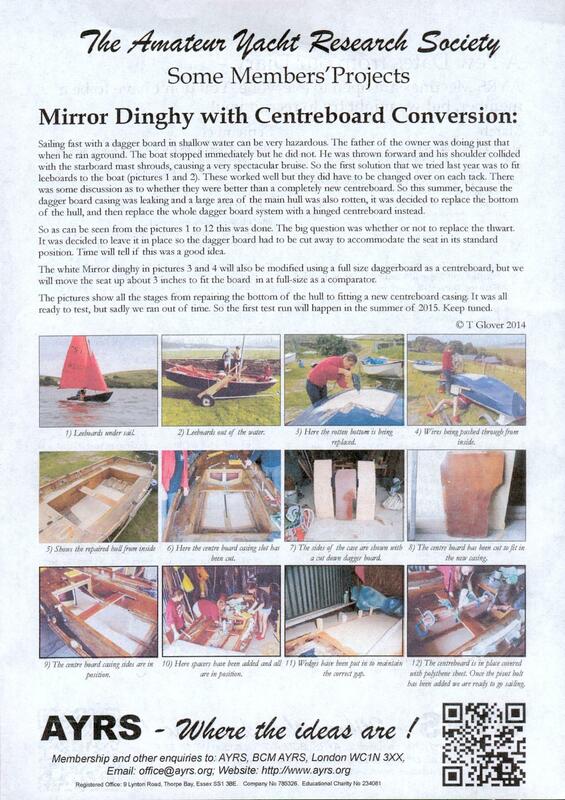 The pictures show all the stages from repairing the bottom of the hull to ftting a new centreboard casing. lt was all ready to test, but sadly we ran out of time. So the first test run will happen in the summer of 2015. Keep tuned.